What’s it about? Yuta Hibiki wakes up in a home attached to a secondhand shop with no memory of who he is and how he got there, with Gridman calling to him from an ancient computer screen. When he goes outside, the shadow of a kaijuu that only he can see looms overhead. Despite all the strangeness, he tries to carry on as usual with the help of his two friends, Rikka and Utsumi. 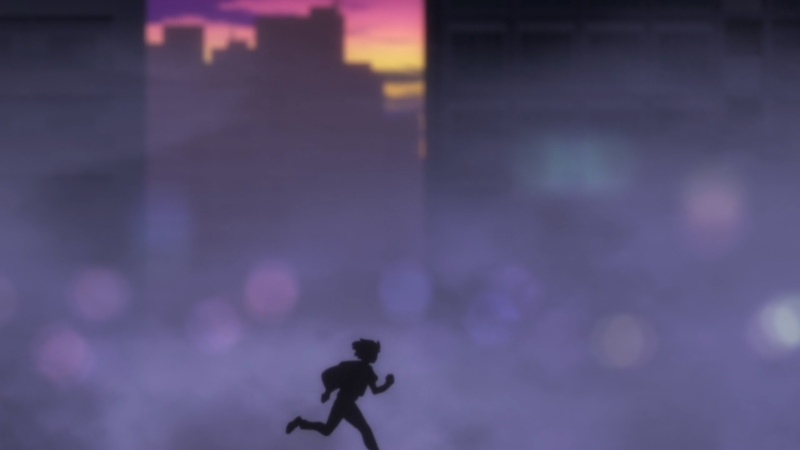 When the kaijuu fully materializes, will he listen to Gridman’s call and defend the city? I don’t know what I was expecting from SSSS.Gridman, but it certainly wasn’t this. After all, its basic components—an old tokusatsu show for source material, production by Studio Trigger, the director of Inferno Cop—indicate something with kinetic, kaleidoscopic action and irrepressible energy. Instead, SSSS.Gridman offers something more slow and subtle, focused on quiet atmosphere and environmental storytelling. The episode starts with several seconds-long shots—a pile of shoes, students leaving school at the end of the day, and so on—with only the buzz of cicadas and murmuring crowds for the soundtrack. A bored teenage girl, standing on the roof, gazing down at the world. Then Yuta wakes up on an unfamiliar couch, in an unfamiliar room, with an unfamiliar girl sitting at the table. Everything is unfamiliar, because nothing is familiar. He can’t remember enough for anything to be familiar. Strong, distinctive direction builds a quiet sense of something being wrong. As he talks to Rikka about what’s going on, their conversation is interspersed with jump cuts, creating the sense that they’re not quite connecting. The glare on the photo of his family blocks out his parents’ faces, and they just happen to be away on business for three months. Unusual camera angles, lasting just a little too long, make the mundane feel disorienting and wrong. The minimalist soundtrack leaves room for background noise, or the lack thereof. When the kaijuu attacks, rather than focus on buildings collapsing and mass panic, we focus again on the strange and disorienting: cars stick out of skyscrapers, and the streets surrounding the attack are strangely empty. And yet, the kaijuu outlined against the city lights glowing in the mist makes an eerily beautiful picture. Move over, DARLING in the FRANXX. This is the truest spiritual successor to Neon Genesis Evangelion yet. Okay, it may be a bit too early to go that far. While atmospheric and visually striking, it doesn’t seem to have quite the psychological heaviness of the most influential mecha series of the last 25 years. Interestingly, amnesiac Yuta tries to carry on as usual as much as possible. It reflects a very human response to the unusual—try to find the normalcy and cope as best you can instead of shutting down entirely. And his relationship with Rikka is certainly intriguing, because while she claims they barely talked before his amnesia struck, he was undeniably in her home. Gridman, adapted to the U.S. by DiC as Superhuman Samurai Syber-Squad, carries with it the same baggage as pretty much every other tokusatsu series: a male-dominated cast with one, maybe two team girls. If there’s two, then one must be the pink girly one and one must be the yellow tough girl. SSSS.Gridman has a team of three instead of five or six, with only one fighter and two support members, which changes the balance of things. The main question is what role Rikka will end up having on the team. In this episode, she takes control of the keyboard to communicate with Yuta while he’s fighting as Gridman. How will she function as part of a trio with Yuta and Utsumi? Well she be able to mesh with them, or will she forever be stuck as The Girl? Will her sharp edges be filed off because of her hinted-at feelings for Yuta? Whatever the case, SSSS.Gridman is one of the most unexpectedly striking premieres of the new season. I never expected to be so drawn in by a tokusatsu retelling, but a strong directorial vision makes it worth a try.